US, 1940, 141 minutes, Black and white. Bette Davis, Charles Boyer, Jeffrey Lynn, Barbara O’ Neill, Virginia Weidler, Walter Hamden, Henry Daniell, Harry Davenport, June Lockhart. 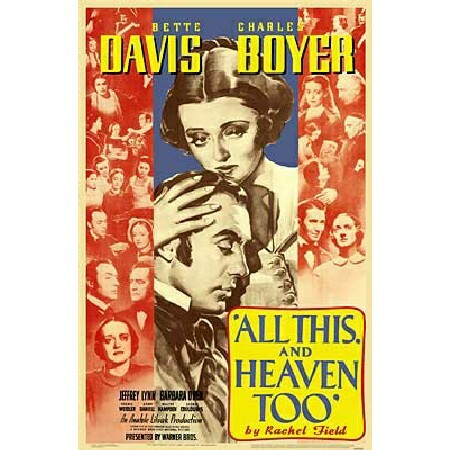 All This and Heaven Too was one of the major films of 1940, nominated for an Oscar for best film as well as for Barbara O’Neil? for best supporting actress. It has all the trappings of a Warner Bros romantic melodrama. The film stars Bette Davis as a teacher, working as governess in the 1840s in a French household. The duchess, played by Barbara O’Neill?, is neurotic and accuses the governess of having an affair with her husband, played by Charles Boyer. Tragedy ensues, the wife dying, the husband killing himself, the governess forced to flee and go to the United States where she becomes a teacher. This is a more genteel and quiet role for Bette Davis. Charles Boyer, of course, embodies French nobility. The film has a strong Warner Bros character actors supporting cast. Direction is by Anatole Litvak who had worked at Warner Bros during this period with a number of significant films including Confessions of a Nazi Spy, The Sisters, Tovarich and Mayerling. He continued to direct war films during the 1940s. After the war he made a number of striking melodramas including The Long Night, Sorry, Wrong Number and The Snakepit. With the coming of Cinemascope and colour, he directed The Deep Blue Sea, the Ingrid Bergman Oscar-winning film, Anastasia and The Journey. His last film was in 1970, the thriller The Lady in the Car with Glasses and Gun starring Samantha Eggar. The film is a Hollywood re-creation of a period – but, in the 1940s, this was done with great attention to detail. The film was based on a novel by Rachel Field who also wrote the novel from which the film And Now Tomorrow (with Loretta Young) was made. The screenplay was by Australian writer, long resident in Hollywood, Casey Robinson. 1. The tone and significance of the title? The indication of romantic themes? The quality of the film as a romance? 2. Warner Bros.' style in the forties: black and white photography, sets, locations, musical score, etc.? Impact now? 3. The appeal of the soap opera to audiences? The human values, the historical background, romance, human values? The quality of this film as a humane soap opera? 4. The film as a Bette Davis vehicle? Audience interest in her and sympathy for her? Her portrayal of a sympathetic character and a victim? How well was she matched by Charles Boyer? 5. The film as based on historical truth? The facts and their presentation in film in the forties? What really would have happened? 6. How attractive a character was Henriette? What kind of person? The introduction at the school and the children's response? As revealed by flashback and gradually? The question of reputation and people's cruelty? The effect of the story on the girls? 7. How attractive a character in herself? The initial presentation of her at work, the qualities of her character, with children, with the Duke, the jealousy of his wife? The various people that she encountered and helped her in her work? Were the events that followed credible for her character? 8. The character of the Duke? What kind of person in himself, aristocracy, French, the quality and falsity of his marriage? The inevitable infatuation with the governess? 9. The nature of the love between the Duke and Henriette? The platonic love, the lack of fulfilment? The inevitability of jealousy and their being victims of plot? The effect on each? 10. The character of the Duchess and her jealousy? The details of her reaction to Henriette? To her husband? Talk in society? 11. The significance of the Duchess's death? Scandal? Murder? The effect on the Duke? On Henriette? The death of the Duke? The melodrama and romance of the playing of his death? Henriette's presence? 12. The impact of the scandal on Henriette? Her migration? 13. The significance and contribution of the minor characters to this kind of film? 14. The human values? The romantic values?